Building repair technology has become increasingly complex in recent years and there is a confusing array of specialist systems designed to counteract rot, decay and damp. In many cases though, the temptation is to go for a technical solution when perhaps more basic, common-sense methods may be less destructive to the building’s fabric and occupants and equally effective. Retention of the maximum amount of original fabric must always be the guiding principle. Good remedial specialists should recommend the best system for each individual problem, but a few general guidelines may be useful. 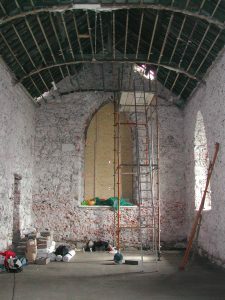 Damp proof courses are rare in old buildings, although a layer of slate or bitumen is sometimes seen running through the wall. Rising damp is often caused when the ground level outside the building is above the floor level inside and dampness is able to penetrate through the walls. Lowering the ground level and providing an external ‘french’ drain (a perforated pipe laid in a gravel bed) around the building to take away excess surface water, and putting in vents to allow ventilation under suspended timber floors will generally alleviate the problem. Gentle background heating inside the house will help to dry out the walls. Most injected chemical DPCs will only work on narrow brick walls. A typical rubble stone wall has voids and rubbish in its core and an injected DPC cannot form a continuous barrier, although specialist grouts are available for filling larger voids. Many old buildings have survived for hundreds of years without a damp proof course but if it is deemed necessary, the best option is an electro-osmotic system, where a titanium wire carrying a very low electric voltage is chased into the plaster around the external walls. Results can be variable on very thick walls, but it is by far the least disruptive method and does not introduce potentially damaging chemicals into the fabric of the building. Treatment for dry rot, woodworm and other fungal and insect attack is another controversial area. The discovery of dry rot in particular is often accompanied by panic and hysteria. The injection of large quantities of toxic materials and hasty over-zealous remedial work has resulted in the loss of many fine interiors. Dry rot will only survive in damp, warm conditions where there is little air movement, in badly ventilated floor voids and behind window shutters for example. If the source of the water is removed and the ventilation of fresh air improved the dry rot will die. There are few experts who will adopt such a studied yet simple approach. Insurance premiums and demands of mortgage companies often lead to radical stripping out of wholly unaffected timber and plaster which may well be unnecessary. A general change of attitude is long overdue. Good maintenance is the best remedy – gutters should be kept free of leaves and debris, broken downpipes and overflows repaired and pointing and flashings, especially on flat roofs and in hidden valleys should be checked regularly. Wet rot and woodworm are easily eradicated without great loss of original fabric. Repairs to chimneys can sometimes seem a black art rather than a scientific process. Flues in old houses were rarely lined and often roof timbers were built into the chimney breast and exposed to smoke. Over the years these can become charred and in some instances can smoulder without detection. This is one of the commonest causes of fires in old buildings, especially if modern closed high output fires burning high temperature smokeless fuel are introduced. This type of fire and ‘coal effect’ gas fires must always have a lined flue. Inserting a flue liner into an old chimney and filling the voids with insulating material can be a dirty and awkward job and is best left to an expert. Even if the flue stays unlined for an open fire, it is sensible to remove built in timbers, especially in thatched houses. Large chimneys are divided into multiple flues which are separated from each other by thin brick divisions called ‘feathers’. Flue gases gradually eat away at the brick and can cause the ‘feathers’ to crack and eventually collapse, blocking a flue or opening a smoke passage from one flue to the next. Birds’ nests, accumulated soot and broken ‘feathers’ can combine to block or even destroy a chimney. Tell tale signs are smoke coming out of more than one chimney pot when only one fire is lit or smoke coming out of one fireplace when the only fire lit is in the room next door. Coal that is not being burnt correctly in a closed fire will produce invisible and highly toxic flue gases of odourless carbon monoxide which can spread throughout the house if left unchecked. It is always a wise precaution to have chimneys swept annually and to consult a ‘chimney doctor’ if you are lighting fires for the first time or are aware that there might be a problem. If it is necessary to rebuild a chimney, the original corbelled courses around the top should be replicated and either the old pots or matching new pots reinstated. Excellent reproductions of traditional terracotta pots are available. Redundant flues must be fitted with a ventilated cap to the pots and a grille built into the chimney breast to prevent damp and condensation. Even unused chimneys add great presence to a house and the temptation to demolish them when the central heating is installed should be resisted.